Some snow on the last part of the hike. 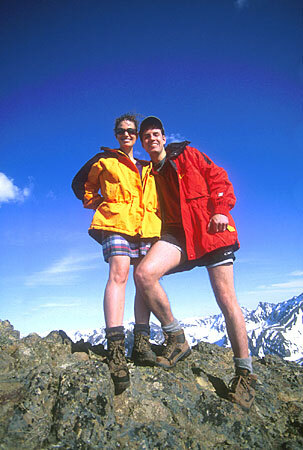 Above Kevin and Samantha Meddleton are seen at the summit of Wolverine. Seward Hwy. south, exit O'Malley, east on O'Malley Rd, Right turn on Upper O'Malley Rd, then left on Prospect Dr., until Prospect Heights parking area on the right side. Trail head at the end of parking. Strenuous trail well developed for the first 2 miles. Great view of the Campbell Creek Valley and Chugach State Park. This trail is a must do, it is more gradual than Bird Ridge and the views at the top are amazing. Click here to see a plane wreck along the trail.